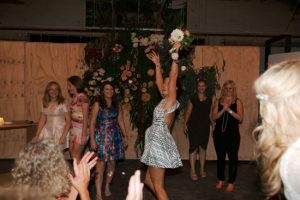 The bouquet toss can be pretty treacherous for the single ladies at your wedding. There’s pushing, shoving, and just downright treacherous behavior—not to mention the plentiful awkward photos to cherish for years to come. If you’re thinking of skipping this tradition, here are five creative (and safe) alternatives to consider! 1 Have a best-gal-pals dance. Get your girlfriends on the dance floor and shake it together to an upbeat song like Beyonce’s “Run the World (Girls).” Now that’s a fun ladies-only activity that has nothing to do with your relationship status. We call that a win-win! 2 Give the bouquet away. Instead of tossing the bouquet into a crowd of uncomfortable women, find the couple at the wedding that has been married the longest (we see you, grandma and grandpa!) and give them your flowers. It’s a sweet gesture and it’s always inspiring to see couples that are still crazy about each other after many years of marriage. Photo by Goldsmith&Co on Polka Dot Bride via Loverly. 3 Hide charms in your wedding cake. We love the Southern “cake pull” tradition. The baker hides a variety of charms — for good luck, prosperity, a life full of travel, etc. — in the cake and leaves long ribbons dangling out. Then, bridesmaids (or any women at the wedding) pull the charms from the cake to see what the future has in store for them. 4 Dedicate your bouquet to a deceased loved one. If there was a special person in your life who died before your big day, take the opportunity to honor them by placing your bouquet in a vase at your sweetheart or head table during the reception. You can also say a few words about the person in a toast or mention them in your wedding program. There’s pretty much nothing more fun or festive than smacking open a piñata with your nearest and dearest. If you crave the high energy of the bouquet toss but could do without the awkwardness, choose this activity instead — and invite all of your guests to participate. Just make sure you leave enough room for Uncle Tom’s lack of spatial awareness! 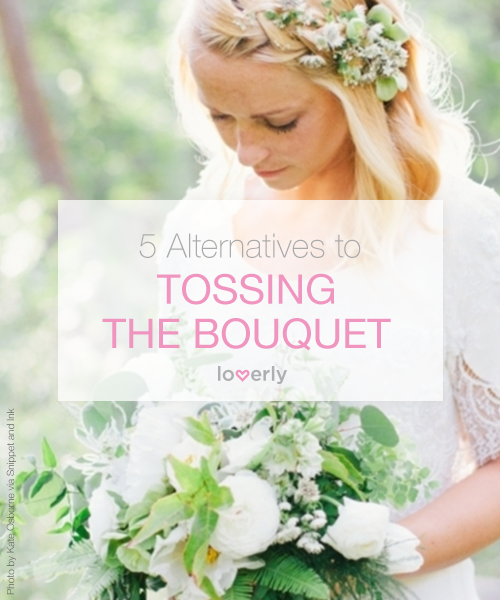 Get more alternative big day ideas on Loverly!